Maureen Fry spent her career in the United States Army where life is defined by standard operating procedures. “We like procedures,” she said of herself and her partners. So when her first effort at finding a post-military career fell short of expectations, she decided it was time to find someone "who could help me figure this thing out." 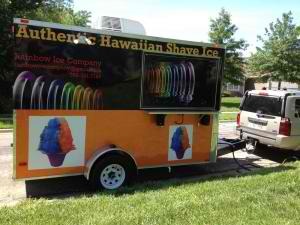 She turned to UCEDC's Entrepreneurship 101 program, which she found through research on the Small Business Administration's website, to help her and her partners make a success out of Rainbow Ice - a mobile concession business that sells shave ice (a popular Hawaiian treat seldom seen on the mainland), ice cream, and other merchandise at festivals around the US. Fry was in unfamiliar territory starting the six-week program. "I remember thinking – I don't know what I'm doing, how hard it is going to be," she recalled. "Am I going to be able to pull it all together?" But what she found was that the UCEDC training staff was "exceptional" and "they were all really on our team from the get go." The program helped her identify mistakes made in the first business and how to avoid repeating them. Fry and her partners - military veterans Marlene Rockwell and Jane Harris – who are based in Lawrence, KS, had started a manufacturing business together in 2012. "Business was OK," Fry said. "It wasn't a success, it wasn't failure. It just didn't make much money." With two long-distance business partners, Fry, who started the business out of her Ocean Grove home knew that "we really needed to hone in on things that were going to work". The training required a commitment, which Fry, who will retire from the military this year with the rank of Lt. Col., appreciated. "I liked that we HAD to do homework. That there were lesson plans. Information on Quickbooks was really awesome, the pricing module was great and the development of the business plan. All those programs allowed us to mold it into what we needed to take away from it." The entrepre neurial training program, which Fry successfully completed in April 2013, helped Rainbow Ice crystallize some business ideas. Originally, the company’s focus, logo and marketing were directed to the LGBT (lesbian, gay, bisexual and transgender) community. But a key component of the company’s marketing plan is to license the name, logo, and product to others as a turn-key business opportunity. To increase their potential market for licensees as well as their own sales, they had to rethink their approach. "We didn't want to get so focused on one demographic that we lost out on other interested parties," Fry said. Armed with a new logo, newly wrapped truck and supported by the UCEDC team, Rainbow Ice has had a busy summer taking their concession truck to festivals around the country. Fry is taking this time to create a “smart book” of the business's do’s and don’ts they will share with their licensees. She’s also enjoying “the really cool people” she’s meeting along the way. Fry and her partners will dedicate the winter months to building the business and promoting their concept’s turn-key investment potential. But wherever they go, they are taking UCEDC with them. Riding along the Rainbow, "UCEDC has a long reach and I am glad we are part of it." Fry said.